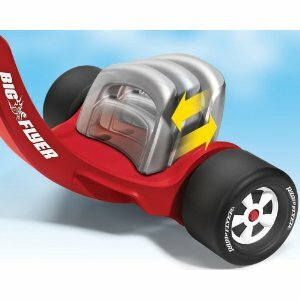 The Big Flyer is probably the most popular modern-style tricycle available today – it gathered really a lot of positive reviews over the previous years. It`s main advantages are cool design, safety and an adjustable seat. Dimensions: 29" x 23" x 23"
First things that everybody notice is the original and cool chopper-style design – your kid literally becomes the king of the road, sitting really low and holding those nice chrome handle bars. Just take a look at the videos at the bottom of this page! The construction is very solid, molded handgrips on the handle bars work also well. 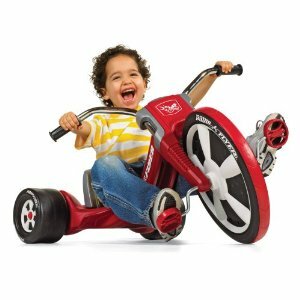 This tricycle is also one of the most stable ones available – rear wheels are very wide and the seat is so close to the ground, it`s almost impossible for the kid to tip over, even at high speed. Unfortunately here also comes a slight disadvantage – the weight is all on back so it can be difficult to pedal in a steep hill. 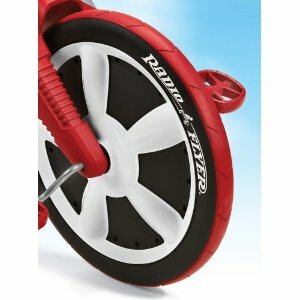 Nevertheless the performance grip tread on the front wheel works well so most of the time you`ll have nothing to worry about. As the trike is so low to the ground, a flag is added for more visibility and safety – that`s definitely a good idea from Radio Flyer. 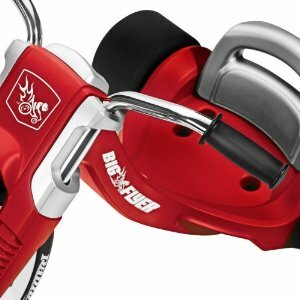 Another great advantage of Big Flyer is that there are three possible positions of the seat which can be changed quickly and easily – so the trike grows with your kid. A few children complained that the seat is not so comfortable – if this happens to you, just wrap the seat in several layers of duck tape and you`ll be fine. There is a pink version of the Big Flyer available as well – so if your little girl would like rather a pink one, no problem – you can find it here. 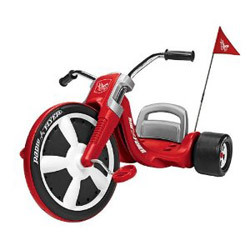 This entry was posted on Tuesday, May 17th, 2011 at 12:31 pm	and is filed under Kids, Radio Flyer.